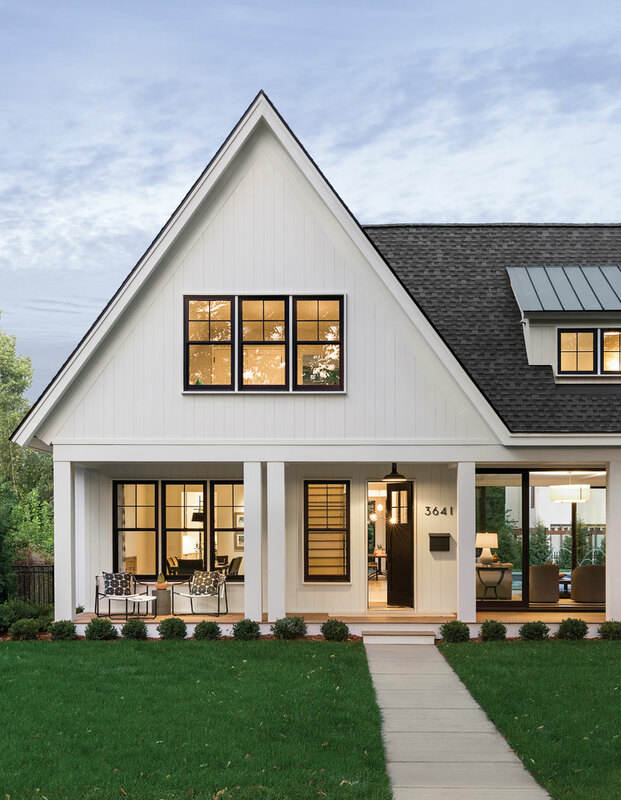 Note the two gabled pavilions with a steep roofline, and dormers and vertical nickel gap siding and metal panels: they’re linked by a glass-walled living room behind the traditional, columned front porch. 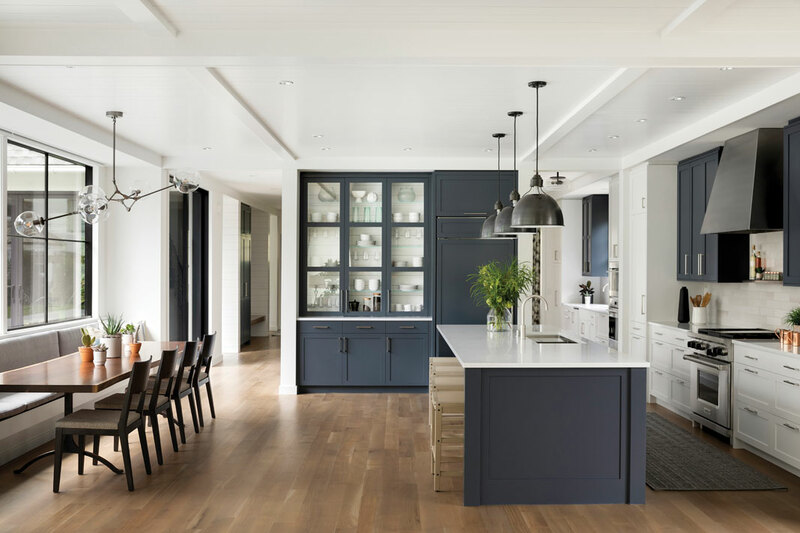 Then enter spacious interiors in a minimalist white, black, and blue-gray color palette, with elegant finishes including white oak flooring, Baltic bluestone and blackened-steel fireplaces, and Paragon Aurea quartz countertops. 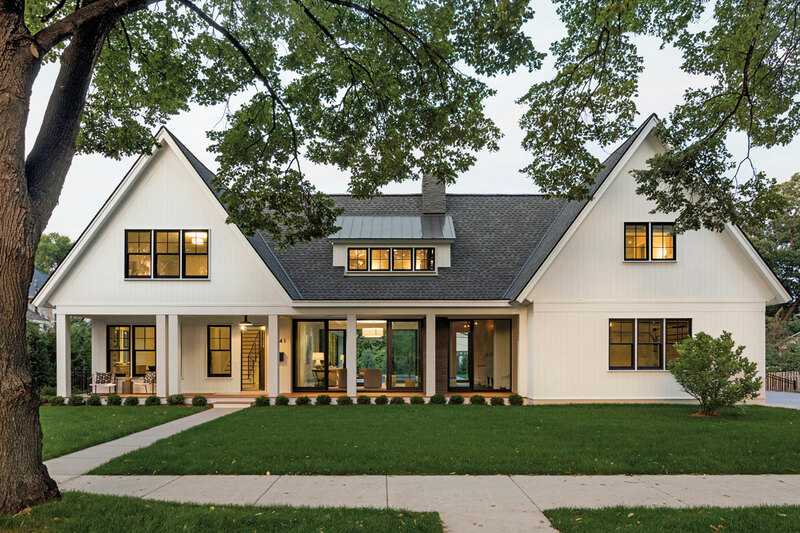 The 5,518-square-foot house blends traditional cottage vernacular with an open modern aesthetic for a truly striking result. Unsurprising for a couple with three kids, the kitchen is the hub of the house. Long enough to include a family lounge with wood-burning fireplace and a harvest table beneath a contemporary chandelier, the kitchen has floor-to-ceiling commercial windows (framed in black steel), which open to the terrace and swimming pool to the west. 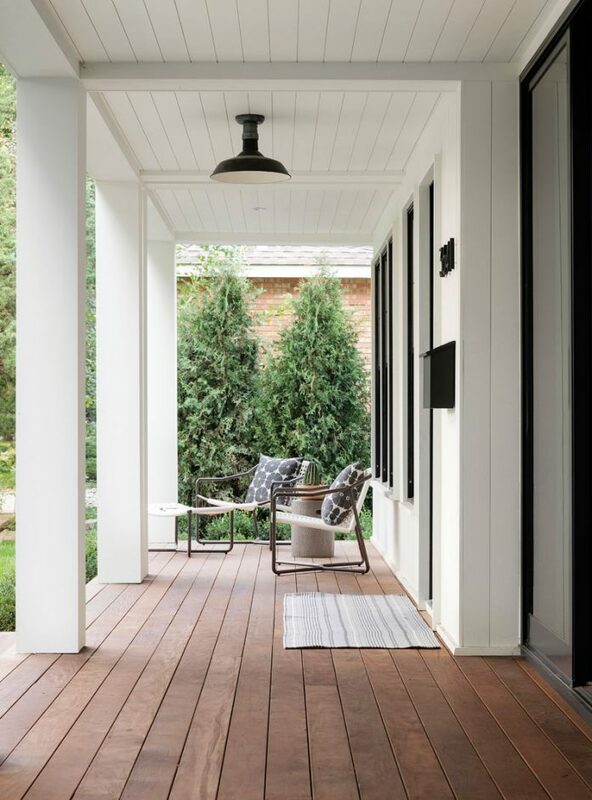 The terrace leads to a bluestone three-season space with retractable screens and a stone wood-burning fireplace. “That space will extend the seasons so much we’ll only really need to spend four months inside,” Walton says. An adjacent hallway has a row of hooks for hanging wet towels and swimsuits, and leads to a pool bathroom/powder room with shower. 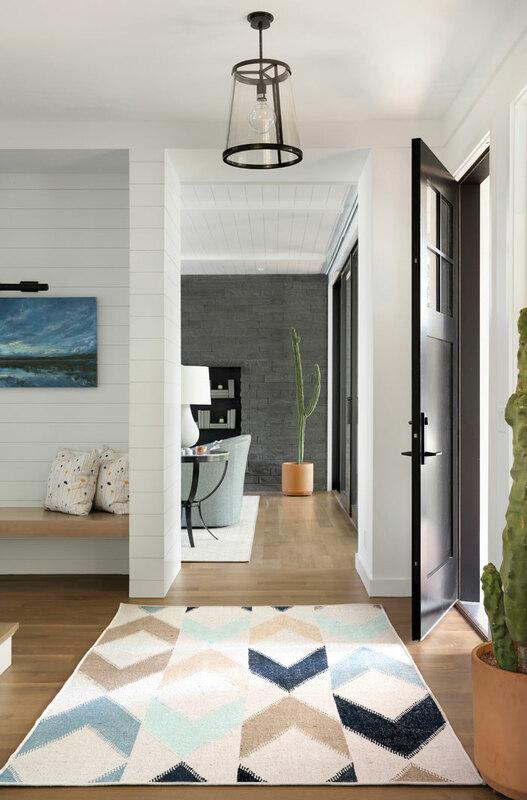 The entry from the garage is a spacious mudroom with lots of cabinets for storing gear and a faucet for filling the dogs’ water dish (for a close-up look on this fun feature, see page 112). 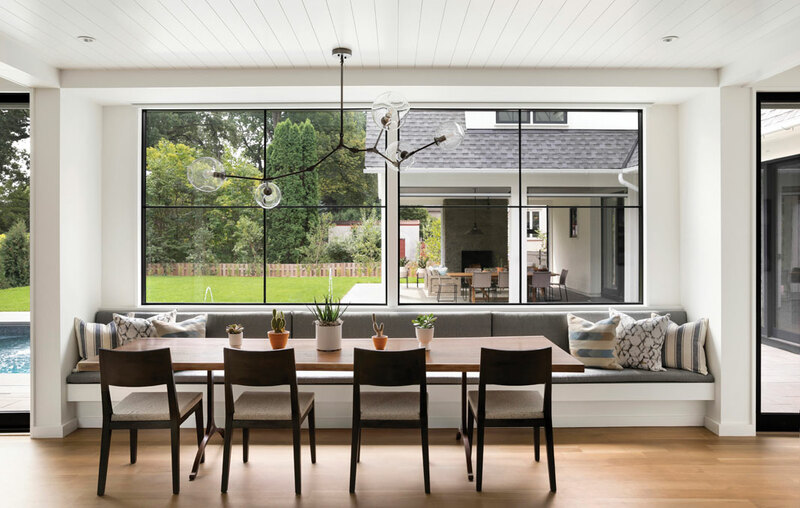 The easy flow between interior and exterior living spaces and bountiful transparency through plentiful windows ensures daylight and outdoor views can be enjoyed even during the winter months. 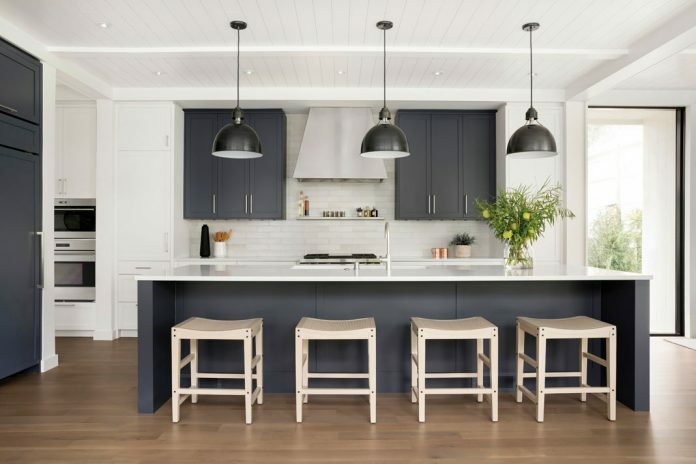 Tucked behind the kitchen with its shiplap ceiling and cabinetry from Nest Woodworking is Breana’s office—command central, with plentiful built-ins for storage and a magnetized wall for notes—across from a prep kitchen with refrigerated cabinets, leading to the home’s formal dining room. The stairs lead to the kids’ bedrooms in the north pavilion, bathrooms, and hangout space with built-in beds. The second level of the other pavilion houses the master suite. 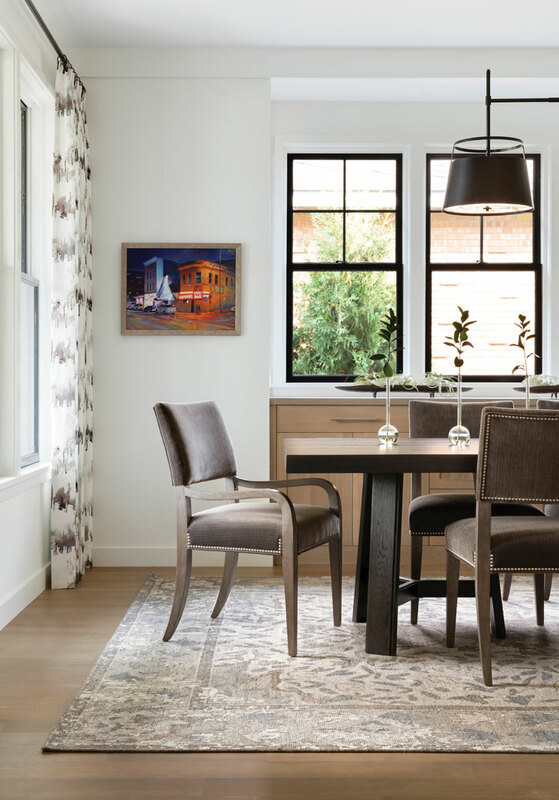 Here, the parents enjoy their own private getaway space with a window seat and wet bar with refrigerator drawers. 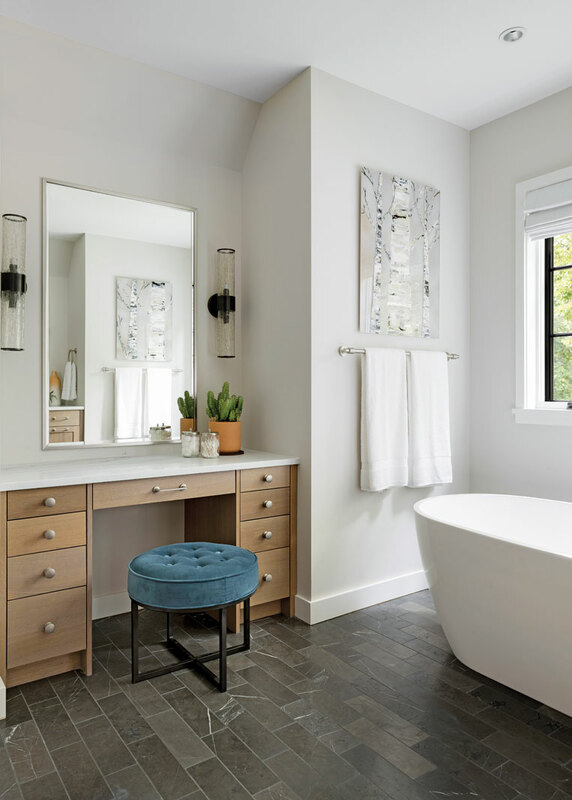 Adjacent to the bedroom is the master bath, featuring white oak cabinetry, a marble steam shower with two heads, and a spa bath. 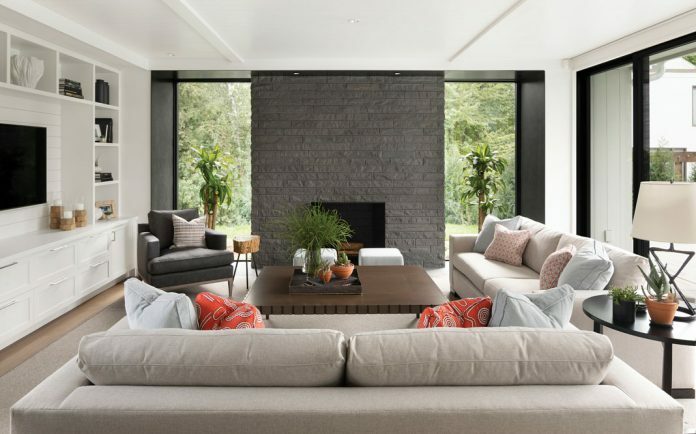 To add pop throughout the house, Martha O’Hara Interiors included contemporary art and colorful, patterned textiles—adding the final touch to a dream home created by a dream team of local artisans.